Kunzite is the icy pink to lilac variety of the spodumene mineral family (the other variety is green Hiddenite). It was first found in the US in the early twentieth century. It is named after George Frederick Kunz, Tiffany’s legendary gemologist and famous gemstone author. Kunzite is called the “evening stone” as it tends to fade in continued exposure to bright light. Kunzite is relatively hard. However, it should be handled with care, because like diamonds, it has a distinct cleavage and a sharp blow to the wrong place can break it in two. Its soft pastel colors symbolize purity and it is believed to be a calming and relaxing stone. It’s thought to stimulate poor circulation and release tension throughout the system. It is sometimes regarded as a symbol for pregnancy. 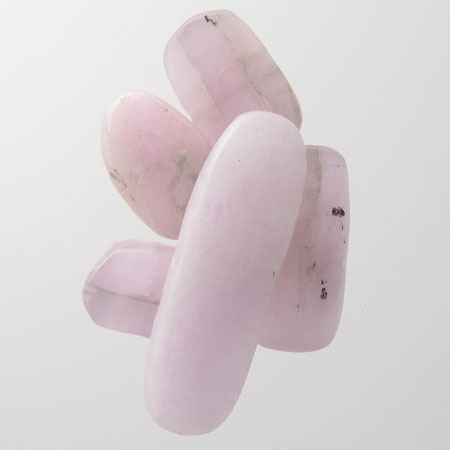 Care: Kunzite should be protected from heat and continued exposure to strong light which may gradually fade its color. Clean with mild dish soap: use a toothbrush to scrub behind the stone where dust can collect. 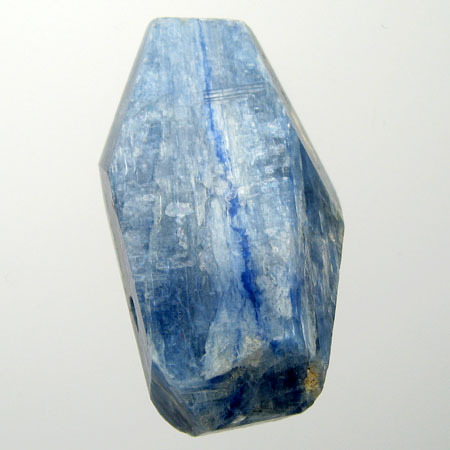 Kyanite, a shimmery transparent to translucent stone, is most commonly found in shades of blue or green. However, it may also found in shades of gray, yellow, white and a quite rare colorless variety. Its crystals are found in long blades or columns. ​Kyanite is interesting in that it can become the sparkle in a necklace or the spark plug in an engine. In addition to jewelry, it is widely used for industrial applications especially in the manufacture of electrical insulators and heat-resistant ceramic (to reduce shrinkage as it expands), and of course in spark plugs. Kyanite is an excellent meditation stone. It is believed to be a stone of channeling, altered states, vivid dreams, dream recall and visualizations, and is said to provide protection during these states. Kyanite is also believed to bring loyalty, honesty and tranquility as well as to diminish anger and confusion. Blue kyanite is comes in a range of shades from pale to deep blue; the deeper the blue the more prized the stone. It is said to improve optimism while dispelling negativity. Some believe blue kyanite helps open psychic ability, enhances telepathic communication, and assists in lucid dreaming. Kyanite’s powerful blue hues have been thought to inspire calmness, composure, serenity, loyalty and respect.